In this laboratory, we primarily conduct high temperature glass melting, hydrothermal ceramic synthesis, and aqueous processing of inorganic materials. This includes multiple furnaces with temperature ranges from 1200°C to 1800°C. Ovens for hydrothermal work as well as a atmosphere controlled tube furnace are also located here. Additional capabilities include impedance spectroscopy, millimeter wave spectroscopy, DTA-TGA, and pycnometer. In this laboratory, we perform temperature dependent measurement (4.2 K – 1000 K) of magnetic moment of materials (bulk metals, thin films, nanopowders, and minerals) using a state-of-art vibrating sample magnetometer. Because of its speed, this system is particularly good for taking minor loop and first order reversal curve data. 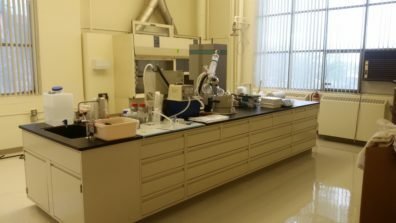 In this laboratory, we perform high resoluton x-ray diffractometry measurements and analysis on all types of materials, but particularly ceramics, glasses, and metals. Multiple X-ray tube sources are used including copper, cobalt and silver x-ray tubes. In this laboratory, we have capabilities and instruments for UV-Vis, FTIR, Raman, Optical microscopy and DLTS measurements and analysis on all types of materials. The Raman instruments is also capable of mapping and two lasers are used, 455 nm and 785 nm wavelengths. In this laboratory, we conduct syntheses of simulated used nuclear fuel to better understand the long-term storage and dissolution of nuclear fuel. Equipment includes: Carver multi-ton pellet press, rotary-evaporator, SPEX 8000M High-energy ball mill, and 1800°C tube furnace.